KILLING IN THE NAME OF BUDDHA – How a well-funded minority of Buddhist monks backed by some high-ranking officials have orchestrated a murderous campaign against the Muslim minority. Burma’s Muslim minority has come under increasing attack from Buddhist mobs. Tom Fawthropreports from Meiktila and Yangon on the racism that is clouding the country’s future. The attacks on Muslims started over a year ago with a campaign against the stateless Rohingya, which Human Rights Watch as described as ethnic cleansing. In recent months, organized mob attacks on Muslim citizens have been inspired by the speeches of Ashin Wirathu, a Buddhist monk, who has toured the country preaching the dangers of Islam spreading and swallowing up Buddhism, and the 969 Buddhist Chauvinist campaign, which encourages shop owners not to serve Muslim customers. The ideology of hate is driven by paranoid predictions of an Islamic takeover of Burma – despite the fact that only 4% of the country’s 60 million citizens are Muslim. The anti-Muslim campaign erupted as the country’s military government loosened restrictions on the press and speech as part of the transition to civilian rule. New media outlets have popped up and the country’s citizens have embraced social media. The town of Meiktila was the scene of an attack on 21-24 March that claimed the lives of at least 44 people, according to official numbers, and up to 148, according to unverified reports. 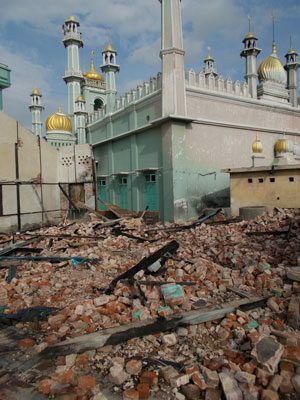 Armed with knives, swords and staves a Buddhist mob damaged over 1,250 homes and seriously damaged 12 out of 13 mosques. Burmese authorities claim that the violence displaced 12,846 people, of whom 8,441 remained in seven temporary camps in Meiktila as of April 9. Hundreds of armed police were mobilised, but — far from protecting fleeing Muslims — they sided with the Buddhist mobs, according to a report by Physicians for Human Rights (PHR). In the small town of Kyo Bin Kauk, about 120 kilometres north of Yangon, an Associated Press photographer was among a group surrounded by a gang engaged in destroying Muslim properties. Their lives were threatened and their photos were seized. This spiralling tide of violence moves on from one district to another. On 28 May, anti-Muslim violence erupted in the town of Lashio, Shan State, with clashes continuing on Wednesday, according to a report. Muslims all over Burma feel threatened. They worry about whether their community will be next. “We can’t sleep at night. We worry all the time. The government does not protect us”, Zaw Myo Lwit, a Muslim teacher in Yangon, told Index. But he was adamant this is not a religious or a communal conflict. “It is a political problem. Most Buddhist monks and monasteries have tried to protect us with sanctuary inside their temples. The problem is the government side and the order of make genocide against Muslims”. Ashin Issariya, one of the monks who led the 2007 “Saffron revolution” observes that Buddhists and Muslims in Burma have lived together harmoniously, when they are not being manipulated by shadowy groups with military connections and racist social media websites. His network of 800 monks is trying to rebuild friendship and inter-faith understanding. His group is sending rice, clothes and other aid to camps housing displaced Muslims. A month after the Meiktila rampage, Burmese President Then Sein was the recipient of “In Pursuit of Peace” award given by the International Crisis Group in New York on Monday in recognition of the democratic reforms and peace efforts. Thein Sein has called for “an end of communal violence” as if two equal parties were engaged in a bloody dispute.